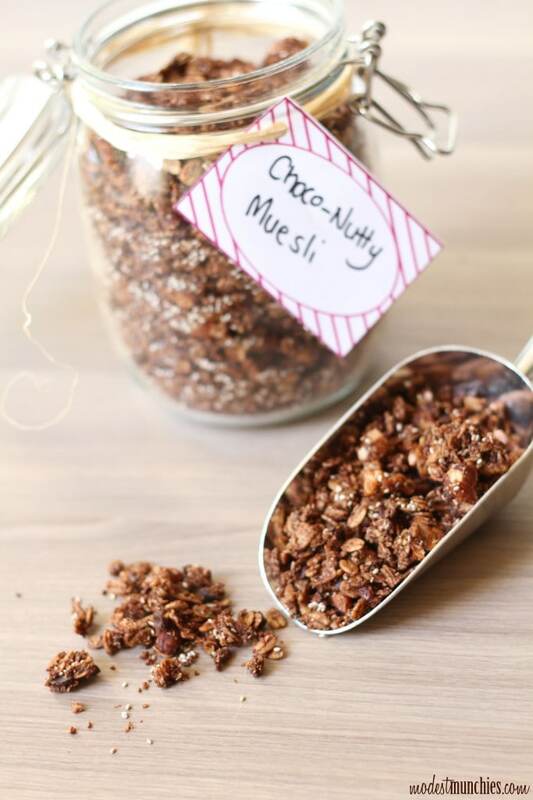 Do you call it muesli or granola? I’ve always said muesli. I think granola is more of an American thing. Either way, it tastes so good! You can of course buy this from the supermarket, but homemade is just as great as store bought (if not better). It’s also a great healthy snack to have on hand, a snack that fulfills your sweet craving whilst not being too bad for you. 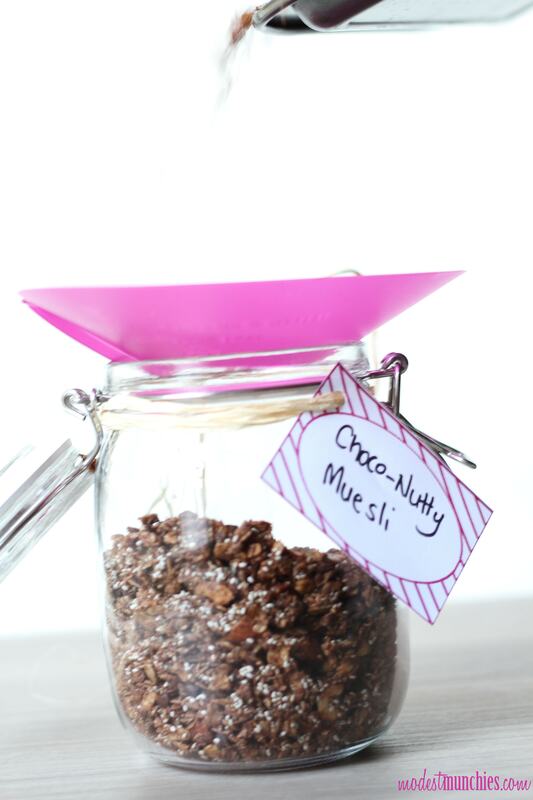 I decided to amp up my usual muesli recipe by making it chocolate! Yum! Pre heat your oven to 160c. Place all the dry ingredients into a bowl. add in the wet ingredients and give it all a good mix. It's best to mix it by hand, it'll get messy but it's worth it. Lay the mixture onto a baking paper lined tray (or 2 if you prefer) and bake. Check on the muesli every 5-10 minutes or so and give it a good toss to avoid any bits getting burnt. The muesli should be done after 30-40 minutes or until crispy. 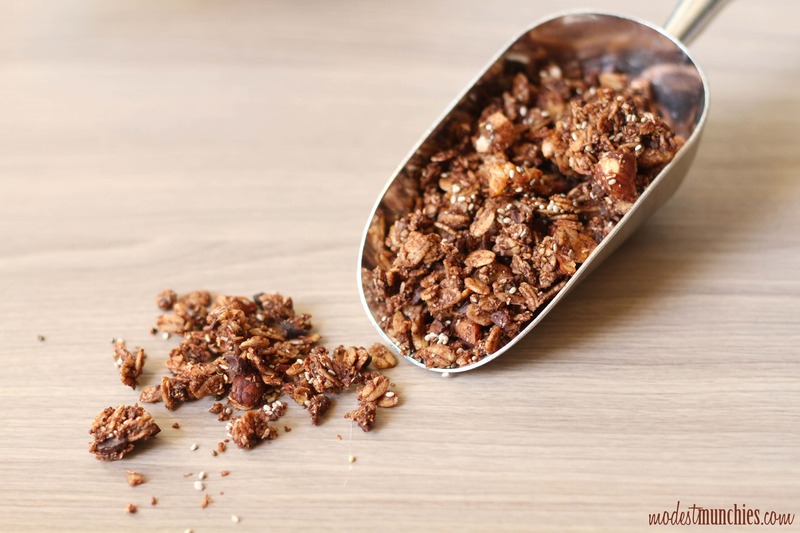 If you have the time, leave the muesli in the oven after turning it off, this will give the muesli more time to crisp up and dry. I won a pair Bigmouth funnels in an Instagram competition. Aren’t they great? All that muesli going straight in the jar. Their new purple/pink colours inspired me to make matching food tags, pictured above. 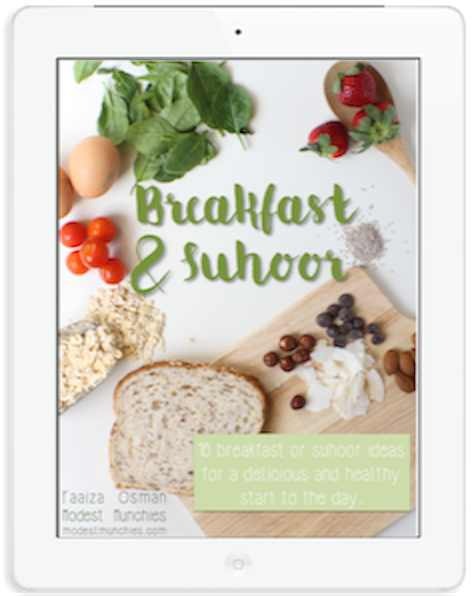 These food labels are in PDF format, all you have to do is click here and hit print. Sold and Sold 🙂 Btw I bought stuff to make your milk tart, wish me luck! Aww, yay! Hope it turns out well for you in shaa Allah. Let me know how it goes! I call it muesli too cos I’m British! i’m intrigued by the ingredient rice bubbles is that another name for puffed rice? 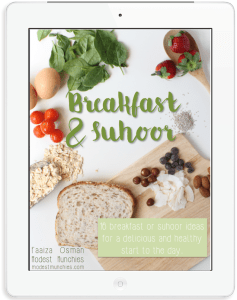 JazakAllahu Khair for sharing this homemade muesli recipe and i’m sure it’s healthier and tastier than store bought! WaAlaikumus Salaam. Good to know the Brits call it muesli too. Yes rice bubbles is the same as puffed rice 🙂 adds some extra crispy crunch. I loveeeee homemade granola! This makes it even better by the addition of chocolate 😉 Sometimes I add some quinoa (if I have it) and it adds a little bit more crunch and nutrition 🙂 Love the tags! Me too! Will have to try quinoa next time. Do you use the flakes or just standard quinoa?